Eurobiz is a student association where students from all faculties and semesters come together. In recent years, we had 40-50 members each semester. It does not matter what you are studying or in what year you are – everyone is welcome! We are connected by being interested in voluntary engagement and getting to know other cultures. 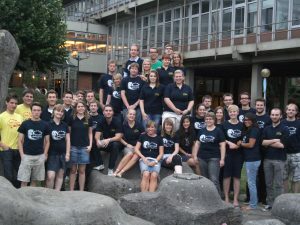 Many members went on an exchange semester on their own or are planning on going abroad, which is not required for becoming a member of Eurobiz. In case you are interested to broaden your horizons and participate in Eurobiz, we look forward to meeting you! Considering our history and development, we can name numerous alumni. 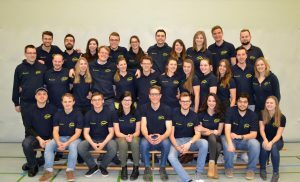 The majority of our former students left Paderborn for work and can be found all over Germany and the world. Every semester, we invite the alumni to come together at the Eurobiz party. In addition, whenever we celebrate a special anniversary we invite the alumni of the last decades to join the festivities in Paderborn! In case you have been an active member of Eurobiz in the past and haven’t heard anything recently, please contact us!